Lehane’s sleuthing bartender faces labor troubles, woman troubles, gangster troubles and even those ancient and terrible Troubles imported from the old country. 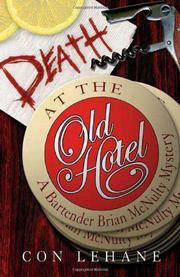 Brian McNulty has a new gig working the stick at the Savoy, a once elegant New York City hostelry. Though the hotel’s best days are long gone, a veteran staff has managed to maintain professional standards. Among these dedicated, hardworking people are Brian’s fellow bartender Barney Saunders and his particular friend and cocktail waitress Betsy Tierney—lovely, sweet-natured and married to a cop whose blue uniform camouflages a black heart. All three are members of the “rank and file insurgency,” increasingly active as the Savoy staff chafes under intensifying exploitation. The exploiters—a Simon Legree of a hotel manager allied with a shamelessly crooked union boss—confront legitimate complaints with an iron fist. Inevitably, there’s an unjust firing, a sympathy strike and finally bloodletting. Barney is badly hurt, Brian is threatened by mobsters, Betsy by her bully of a husband. In behalf of his friends, Brian (What Goes Around Comes Around, 2005, etc.) is forced once more to turn sleuth, not very efficiently this time. But how’s a detective to manage when those very friends hide the deepest secrets and tell the darkest lies? The Brian who once was amiably feckless has become multi-faced and fully engaged in a world he never made, adding substance to a series that keeps getting better.